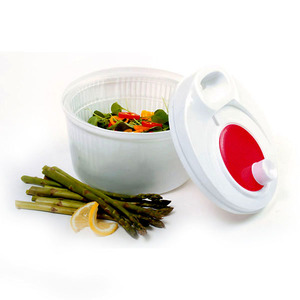 Washes and dries salads in one easy step. Has a unique flow through operation and a smooth spinning mechanism. Water enter through the water hole in lid and drains out the bottom. Draining basket doubles as a colander and has a practical bowl base. Measures 9"/23cm diameter.